I read this article in the newspaper today and thought it worth a share. It’s a lovely yarn of ANZAC Day comradeship, beautifully told by one of Australia’s most unique yarn-tellers, Peter FitzSimons. Well worth a few moments of your time. The Shrine of Remembrance in Melbourne has gone all Bomber Command on us. As I’ve posted previously, there are a number of events happening there over the next couple of months. 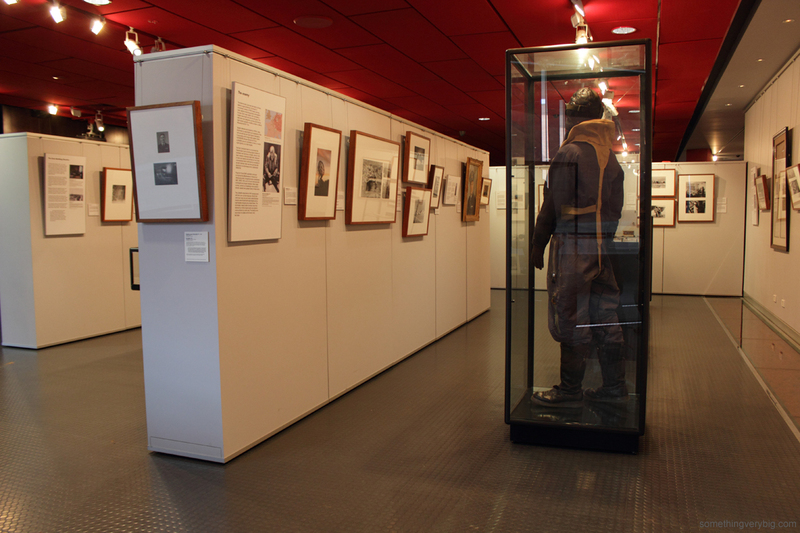 All tie in with a major temporary exhibition which opened earlier this month in the Shrine Visitor Centre. 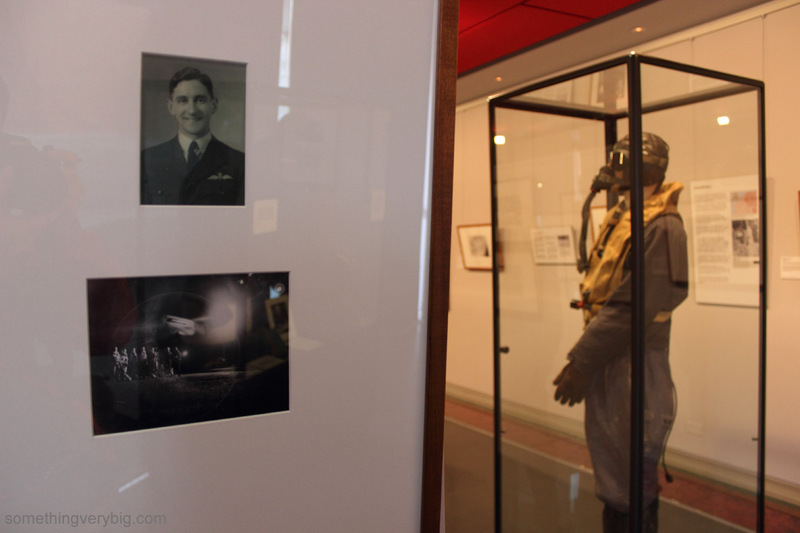 Bomber Command: Australians in the air war over Europe 1939-45 is open until 1 May next year. 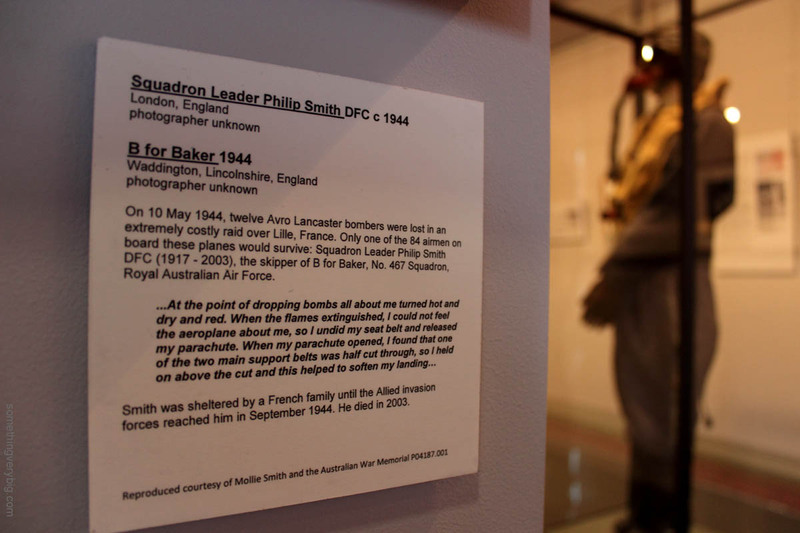 It’s only a fairly small exhibition but it covers much ground concerning the Australian experience of Bomber Command, from enlistment, through training to operations and afterwards, including a significant section on prisoners of war. 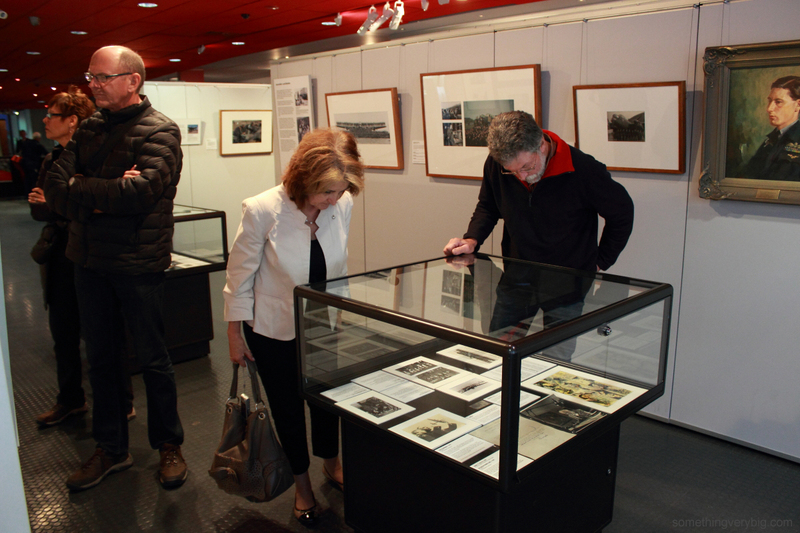 There are photos, artwork and memorabilia that have all been put together in a professional manner, and it is already beginning to draw visitors from all across Victoria and other parts of Australia. 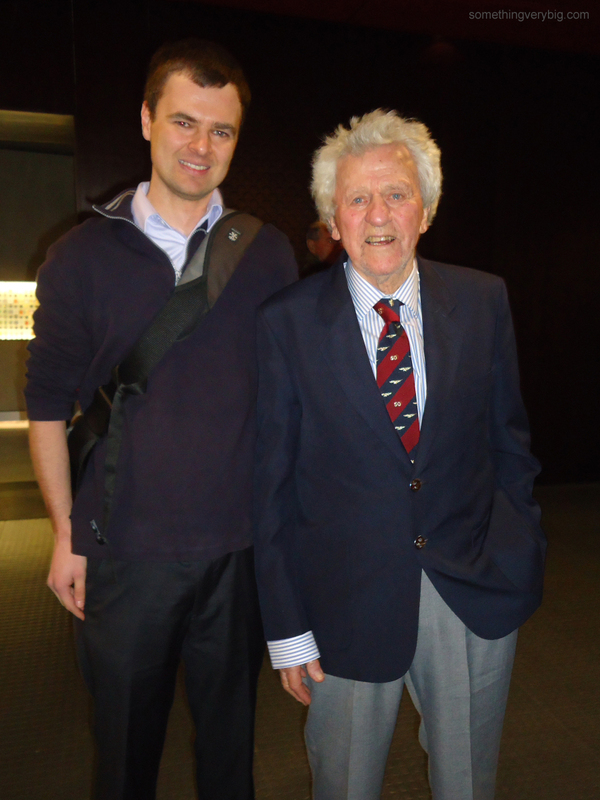 I visited last week with Robyn Bell, one of my Bomber Command contacts in Melbourne. 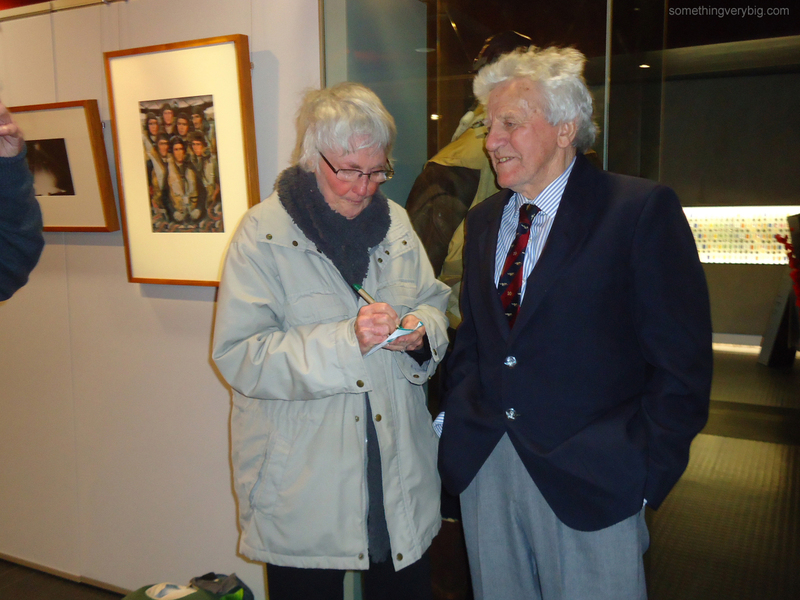 Rosemary Grigg (on the left) was overwhelmed to meet a real-life Bomber Command veteran – Gordon – because her father had been an airman too. Allan Joseph Grigg was killed on 22 July 1944 in a Wellington accident near Lossiemouth in Scotland, where he had been serving with No. 20 Operational Training Unit. She is keen to find out more about her father’s service so I’ve given her a few pointers on where to begin. As always, the fact he was Australian makes life much easier. It’s clear that, in the last two or three years in particular, Bomber Command is finally receiving the recognition it deserves. An official memorial was opened last year in London. A Bomber Command clasp is now in the process of being awarded to surviving veterans, before being extended to the next-of-kin of those killed during service or who have died since. And the Canberra weekend is now the third largest annual event held at the Australian War Memorial (behind ANZAC Day and Remembrance Day). There’s no doubt that interest in Bomber Command, and respect and recognition for those who were involved, is growing. 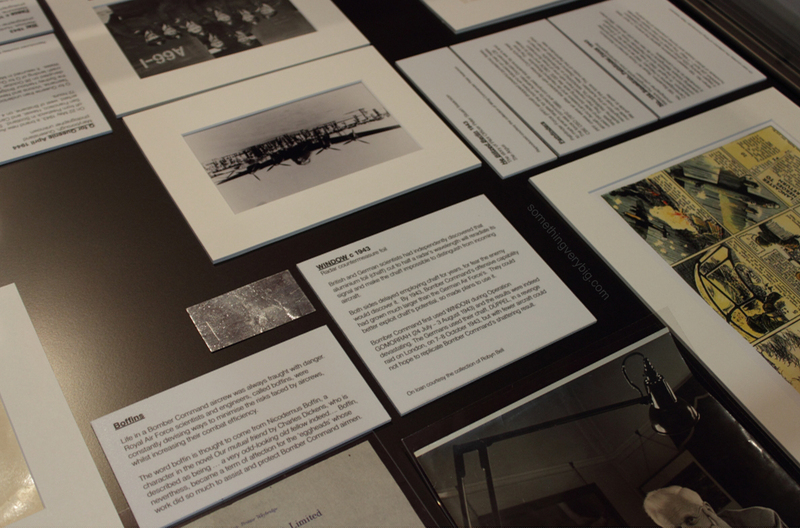 It’s great to see some of that interest manifesting itself in this exhibition. More people will visit and learn about Bomber Command and the men who were part of it. The stories will live on. And that’s the most important thing. 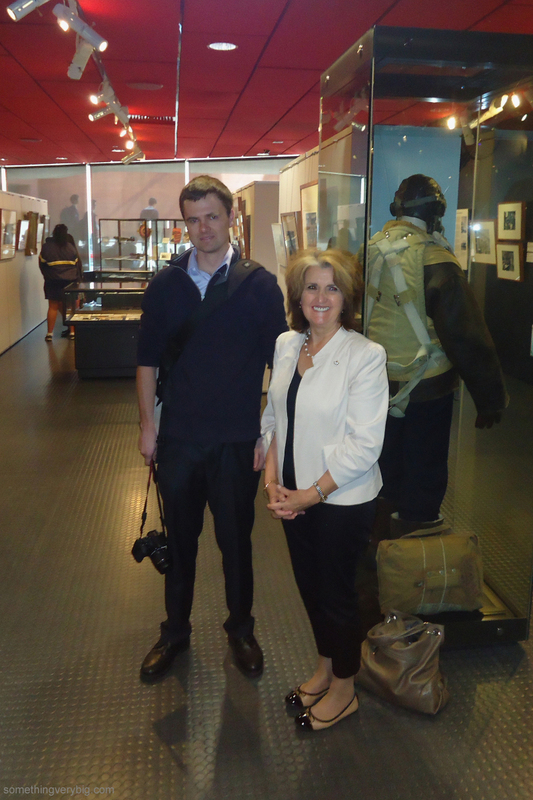 So I’m visiting the Bomber Command exhibition at the Shrine of Remembrance in Melbourne with Robyn Bell. Full report to come when I get home, but look what I found around a corner! It is, of course, a portrait of a very young Phil Smith with the only known photo of the whole crew of B for Baker. Nice to see some recognition of them in a major Shrine initiative. Cost: Free, but a gold coin donation appreciated. Bookings are essential and can be made through this link on the Shrine’s website. I’m normally in Sydney with the 463-467 Squadrons Association on ANZAC Day so, despite having lived down here for almost three years now, I still haven’t managed to meet many of the Melbourne-based Bomber Command crowd. This event should offer a good chance to redress that! Cost: Free, but a gold coin donation is welcome. Bookings are essential and can be made online via this page. Australian author, comedian and journalist Michael Veitch’s life-long obsession with the aeroplanes of WWII and the men who flew them manifested itself a few years back in a fantastic couple of books. Flak, published in 2006, and Fly, from two years later, are remarkable collections of short stories based on interviews that Veitch carried out with about a range of airmen who flew in many and varied parts of the Royal Australian Air Force (among them Pat Kerrins) – and even includes a couple of former Luftwaffe pilots who moved to Australia after the war. For bookings, or for more information, follow this link. Unfortunately I’m unable to attend this talk, but if anyone does, please leave a message here afterwards to let us know how it went. The Temora Aviation Museum has begun a project they call Unsung Heroes. 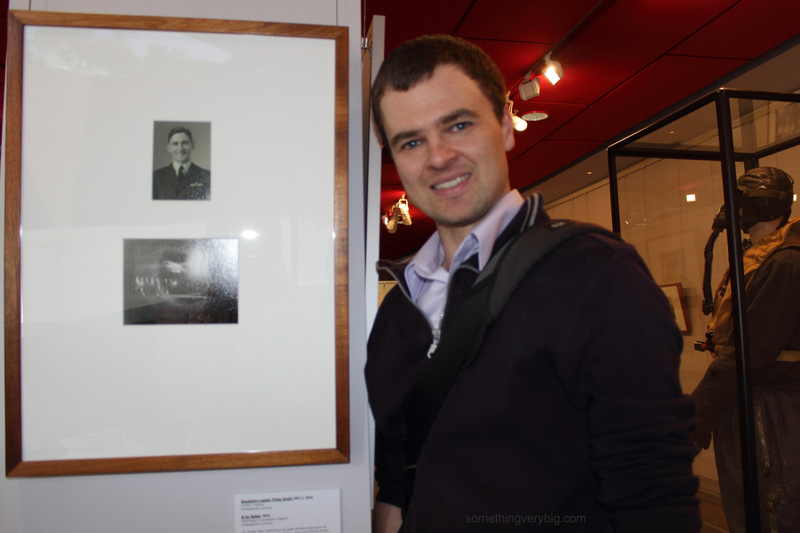 To try and stem the tide of lost memories, the Museum is collecting stories of people who were involved, in one way or another, in Australia’s military aviation heritage. As the project gets underway the collection of stories on the website is so far not a large one, but there are some interesting people profiled in the entries currently there. At $85 a pop, though, the privilege is not cheap, and I’m not sure how I feel about compelling such a significant donation in order to submit content to the database. But at least the Museum is making an effort to recognise the creators of the heritage they preserve in the form of their flying warbirds. An offshoot of Unsung Heroes is a video database aimed at a similar group of people. According to the latest email from the Museum, the database “includes men and women who, although not given recognition in the history books, have been vital to the pioneering spirit of Australia’s military aviation heritage.” There’s thankfully no mention in the email of any fee for taking part in this part of the database, and it looks like the Museum is looking for veterans to interview. 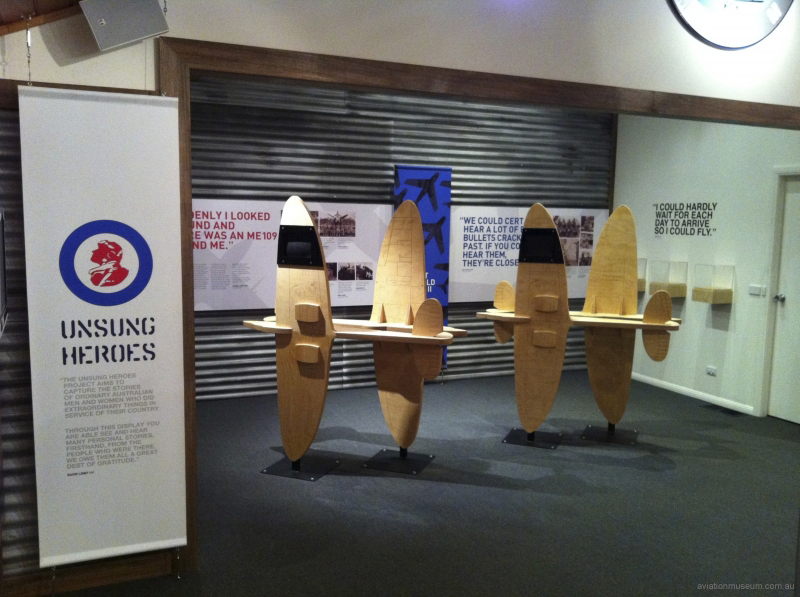 Selected interviews are it appears available to view via iPads installed in a permanent exhibit in the Museum’s galleries (see image above – from the website of the designer, Bob Shea). And here is the reason for this post. The biggest event in the calendar of the Temora Aviation Museum is Warbirds Downunder, an airshow featuring all of the Temora Aviation Museum’s collection of aircraft and a whole host of other significant flying warbirds. This year it’s scheduled for Saturday 2 November, and the Museum’s videographer will be there, covering the airshow but also interviewing veterans for the database. With limited resources it appears unlikely that the Temora database will ever even begin to approach the scale and sophistication of the excellent and extremely far-ranging Australians at War Film Archive (which had the backing of the Australian Government), but it’s perhaps an opportunity for veterans to take part in a less-formal interview situation. Temora is a long way away from any of the state capitals and getting there is a bit of a mission (unless you fly out there in a private aircraft, as I’ll relate in a future post), but if anyone is interested in taking part, contact the Museum by email or by phone on 02 6977 1088. Hat-tip to Kevin Jacobs for the heads-up.